Google recently rolled out the next version of their operating system, Android Oreo. The biggest feature in the app is the ability to activate picture in picture mode for most apps that support it. It allows users to use two apps at once or have an app running while they continue to use their phone at the same time. The overlapping concept is very useful on a smartphone because you can continue to use Whatsapp while checking out the pictures or videos sent over the app. Similarly, a new update is about to be rolled out for Google Maps to support PiP mode. While the particular feature was rolled out to the app many weeks ago, it didn’t work as intended until now. A couple of gifs have popped online that should give you a quick overview of how easy and convenient it will be, if Maps continue to run in the background while you use your smartphone. A lot of users face a scenario when they navigate while answering phone calls or sending text messages. 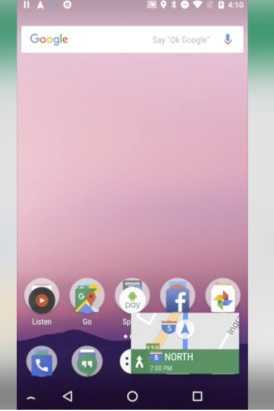 In the particular gif, it is also evident that you will be able to minimize the size of the Maps and when you double tap on it, it will instantly blow up to full size covering the entire display. The transition is fluid and seamless that users will come to appreciate when it is rolled out to them all. When you press the home button, the Picture in Picture mode should automatically activate. At the moment, there are some bugs and performance issues that deters the mode from working as it originally should. A Pixel community manager, Orrin came up to the rescue and provided some information on what they are working on. He confirmed that the Google Maps PiP functionality is still under development and should be rolled out in a couple of weeks. Once done, everyone will be able to access the feature by pressing the home button. Not every device runs on Android Oreo 8.0 operating system but a couple of new phones have launched and all flagships will eventually receive the update, making it prevalent for most users. In other news, Google Photos now cache videos so that it doesn’t use bandwidth every time you view them and will ensure the videos or photos load instantly whenever you open them on your device. It should save users from having to rely on mobile phone network and browse through memories whenever they like to.